Donating to Susquehanna Heritage during the ExtraGive will have double the impact this year! 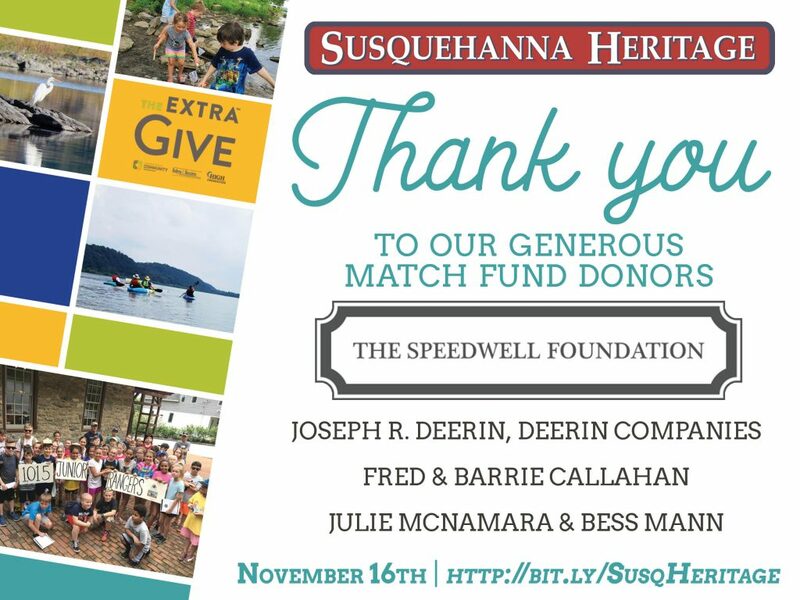 Each donation given online on Friday, November 16th will be matched dollar-for-dollar from a pool of $8,000, courtesy of the Speedwell Foundation and several generous donors. Susquehanna Heritage depends on your support to enhance our riverfront communities. Your donations expands parks, trails, and water access up-and-down the river. Your contributions sends hundreds of local children to the riverfront for a transformative outdoor experience. Your gift will preserve artifacts and river art for all to enjoy. We couldn’t do this without your support. Join us at Columbia Crossing for the Extraordinary River Party to give and get something back. When you donate to Susquehanna Heritage during the party, your gift will be matched and you will receive a special gift. For donations of $25, Isaac’s Deli & Restaurant has kindly provided free dessert vouchers. For donations over $50 or more, you can take home a Susquehanna Heritage etched wine glass created by Susquehanna Glass. Drop in anytime between 4pm and 8pm to celebrate the river! Remember you’ll have just one day – Friday, November 16th – to donate online at http://bit.ly/SusqHeritage to do twice the good for the river!